Foster grandparents have become a fixture at the Paynesville Area Elementary School. It isn't uncommon to hear a student walking down the hallway call and greet a person as "grandma." 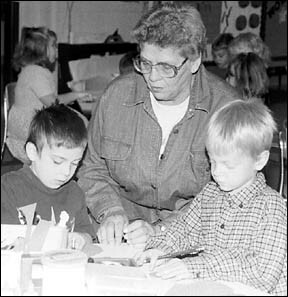 Rosella Anderson and Evelyn Bruntlett (pictured at right with Justin Soine and Dirk Doom) volunteer their time to be foster grandparents at the elementary school. Katherine Halverson goes into the homes to reach out and help students. The Foster Grandparent program in Minnesota is celebrating its 35th anniversary this year. There are about 600 foster grandparents that provide 20 hours of service each week to 1,500 children with special needs in Minnesota. Catholic Charities sponsors the program in Minnesota. It is an intergenerational program for those 60 years of age and older. Their hours are flexible, they are not limited to certain hours. They can work anywhere from 20 to 30 hours per week. The foster grandparents serve special needs students in schools, early education programs, residential facilities, and social service agencies. Betty Schmitz, director of the program in the Catholic Charities Dioceses of St. Cloud, said volunteers receive three to eight hours of orientation and monthly inservice workshops. "I look for volunteers who are nonjudgmental and who will provide unconditional love to the kids," Schmitz said. "I've never turned down anybody," she added. "They wouldn't be volunteering if they were not committed." The training helps prepare the volunteers to work with special needs children and how to help children become better readers. In addition, they provide information on senior citizen issues such as how to be aware of fraud, and health issues. Todd Burlingame, elementary principal at the Paynesville Area Elementary School, said Paynesville has been part of the program for about seven years. Foster grandparents do not need to prepare any lessons, they just need to be a grandparent and help out in the classroom. "The relationships they build with the kids are great," he said. "We never have enough hands to help at the school," Burlingame added. "Catholic Charities is always looking for more foster grandparents." The school provides the foster grandparents with meals and we do little things to recognize them, showing that we appreciate them, Burlingame said. Rosella Anderson started as a volunteer in December. "I was bored staying at home and needed something to do," Anderson said. Anderson listens to the children read and helps them with their spelling and math in the special education classrooms. She also helps with special students in the lunchroom. "I'd highly recommend this program for others," Anderson said. "It is quite a program." Anderson saw an advertisement in the newspaper and called Catholic Charities. "I enjoy working with the kids," she said. "A lot of kids call me grandma that I don't have anything to do with at the school." Anderson spends fours hours per day at the school, five days a week. "That still leaves me a half day at home to do other things," she added. A Paynesville resident for only three years, Anderson has 12 grandchildren and two great-grandchildren of her own. When not spending time with the children, she enjoys reading, knitting, crocheting, and watching the Minnesota Wild on television. This is Evelyn Bruntlett's third year as a foster grandmother in kindergarten. "I enjoy being with the kids and working with them," Bruntlett said. "It's a fun job," she added. She works all day on Wednesdays at the school and even takes field trips with the students. "Every day is different," Bruntlett said. "I love helping the kids, it keeps me coming back." "It's an easy job to have," Bruntlett added. Bruntlett has nine grandchildren, one step-grandson, and two great-grand-children of her own. She enjoys bowling, playing cards, and taking care of her grandchildren. The foster grandparents are there to help the kids so they won't fall through the cracks. They provide more one-on-one attention to the kids. "The grandparents are not there to do disciplining. They are people that kids learn to trust and to be good listeners when kids want to open up and talk," Schmitz said. Anyone interested in volunteering to be a foster grandparent can contact Burlingame at the elementary school, 230-243-3725 or Betty Schmitz at 320-352-6120, extension 23.